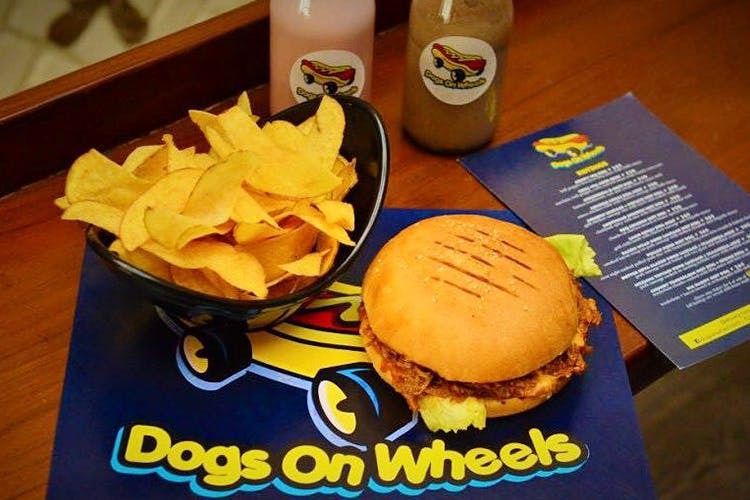 Dogs On Wheels is the latest addition to the hot dog and burger scene. They deliver in and around Khan Market and GK2. They’ve got a wide range of burgers, hot dogs, pizza, and pasta–something for every palate. A juicy hot dog or a crunchy burger has the unique superpower of turning around the baddest of days. If that's your favourite way to cope (it's ours for sure), you’re going to love Dogs On Wheels. These guys, we hear, have somehow managed to scale the hot dog game—well, probably by serving kickass hot dogs, and we're not complaining. They’ve got around 15 options when it comes to the dogs, and around 10 for the burgers, with both veg and non-veg variants for both—so no one feels left out.They also deliver till four in the morning, so your afterparty scenes shall never be food-less again! You’ll find everything from tenderloin chunks and pulled pork to chettinad chicken and grilled veg cous cous in the hot dog section, and ever-so-drool-worthy variants like the Mushroom & Oats, Chicken Ham & Cheese, and Shrimp & Lamb in the burger area. They've also recently added two new sections for pasta and pizza on the menu, and it looks insane. We're eyeing the pepperoni pizza (classics FTW) and the carbonara pasta. How about you? They only currently deliver in and around Khan Market and GK-2, so if you're not in these areas, you're out of luck–we hope they start delivering to more areas soon.